A pergola plan can pave your way to build a wood pergola in no time at all while saving you a lot of money over ready made kits. It contains all the measures, sizes and shapes for you to build a pergola and avoid costly purchases. A pergola is a relatively simple structure to build and an ideal testing ground to start a woodworking career, providing you follow few simple tips. 1) Check out the suitability of the pergola position. It must be a good spot so as to balance the whole landscaping and the garden areas. 2) Make sure to check for underground utilities before you dig out for the post foundations. If not sure, call in the local authority to have an all clear. 3) Pergolas are light structures, but the rain can make the soil soft and have the posts moving or sinking. So get hold of cement to create a sink proof foundation base for the posts to settle in. 4) Rent few tools: you may have a hammer or sandpaper laying around the house, but you may need to borrow or rent electric tools like a circular saw, a drill, or an angle grinder to cut, drill and finish all the parts. 5) Beams and posts are heavy and a potential hazard to move and lift, so ask a buddy to help you in the project. 6) Never fill in the post foundation holes before having bolted the main beams on the top. Bolt the beams on first to allow for adjustments and close the main structure, then fill in the holes. 7) Use only top quality wood like cedar, even if expensive. It is a wise investment that will pay itself for generations to come. Since you are already saving few $thousands on ready made kits, do not be tight on material quality. 8) If feasible, build the pergola south facing if you live in the northern hemisphere or north facing if you live in the southern hemisphere. Climbing vines and hanging flowers will rejoice it. 9) Choose a pergola plan suitable to your expertise. While pergolas in general are easy structures to build, a square or rectangular one is the simplest both to build and arrange tables and chairs in once finished. 10) While cedar and red woods are naturally resistant to rain, UVA, termites and decay, it is wise to further increase their durability with a couple of coats of resin based wood stain. Wood stains come in different grades and tones and will naturally enhance the wood texture and patterns, making the structure glossy and even more appealing. Pergolas come originally from Italy and were a garden landscaping extravaganza for people wealthy enough to have a garden where to build it, usually over walkways to provide shade as well as a ready to pick supply of grapes from the vines climbing over them. Today, while more accessible, they are still an expensive structure to buy ready made. A pergola plan can assist you in this, providing you with a blueprint for a DIY project and helping you save few $thousands over ready made kits. Just do not save on wood quality, though. A pergola plan will give you all the measures and graphics necessary to cut and shape posts, beams and joists and erect them. 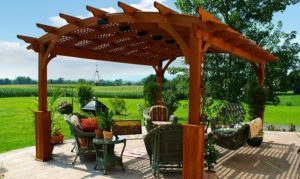 Indeed, a DIY pergola project is ideal for a novice without carpentry experience because it is basic in its outlines, yet provides a final stunning result that will increase property value and household quality of living. Wood is also a pliable material that allows for mistakes and corrections to be made, so even if you get a short rail or a long post you can easily make amends.